Only Confederate monuments are defaced…..really? I wonder what was so historically inaccurate…. Next Attention All!! Would you Like to Help Me Design A Class? 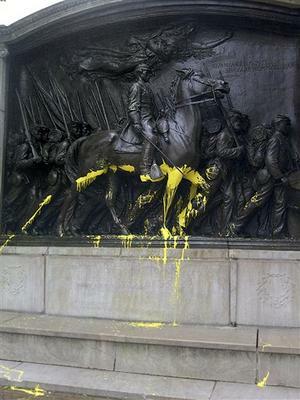 Defacing of monuments of all sorts — not just CW monuments — is depressingly common. It happens to plenty of Union monuments, too. Well it appears someone finally stepped up. However, that is an individual with support. No word from larger organizations.